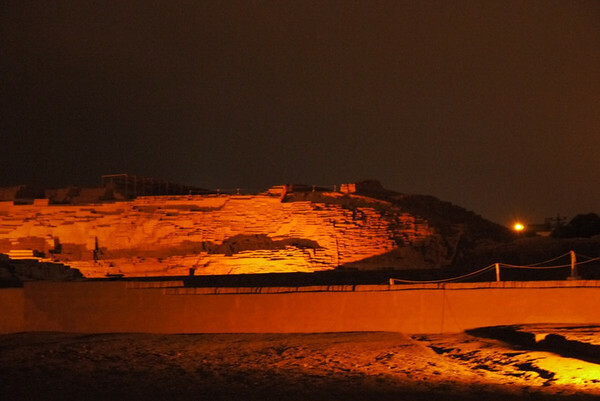 Bright lights, classy city, crazy drivers – greetings from Lima! 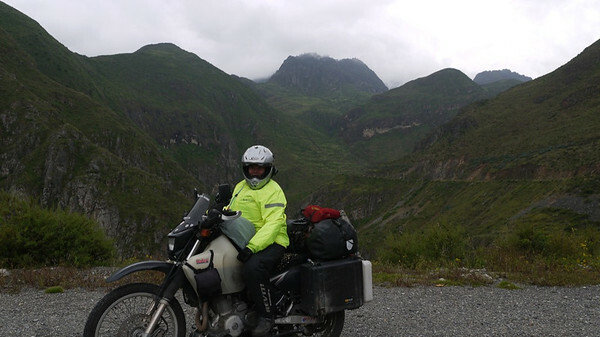 We arrived in Lima mid-afternoon after a long day’s ride through more coastal desert. This time the road had us travelling up and down over mountains (or sand dunes?) as we coasted alongside, well, the coast. The weather wasn’t ideal and we rode all day underneath damp, overcast skies with a pretty hefty crosswind. Dry desert with a little coast from time to time. In some places the sand dunes looked like paintings, with rich golden swirls, engulfing abandoned houses buried up to their rooftops. As always, picturesque places don’t mind where they are and often they are alongside inopportune places to pull over. We also encountered a lot of road work where the highway was down to a single lane for re-paving, usually on a hill, usually stuck behind a truck doing 20 km/hour, or slower. As our motorcycles are more agile we were able to pass by most slow-moving vehicles by skirting around the pylons. Let’s backtrack a bit, shall we? We managed to pull ourselves out of bed long enough to leave Huaraz. A sad day, as I had grown quite comfortable there. It truly is a great little city in a spectacular setting with mountains on all sides, sunny days, and plenty to see and do. It has great cafes and almost any kind of food that you can imagine. 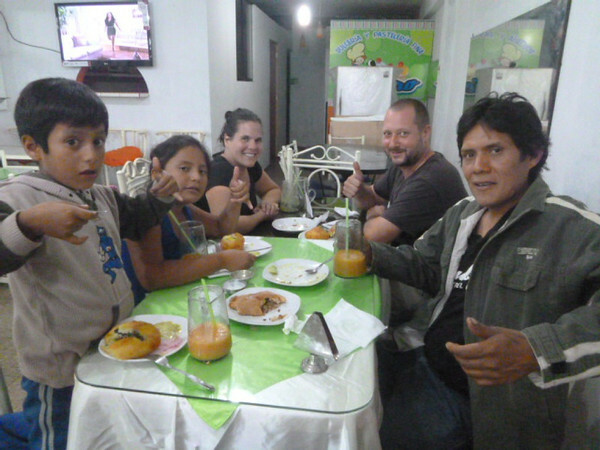 From cuy to pizza to chifa to great beer, our bellies were kept happy with Huaraz’s culinary offerings. Unfortunately it seems that we still haven’t figured out the mystery of the battery draining grip warmers on my bike, and when we went to start the bikes up (after not riding for almost a week), my battery had certainly been drained since I had forgotten to turn the switch off after arriving in Huaraz. Adam believed that he had addressed a wiring issue but hadn’t confirmed the fix – apparently there is still an issue. After that excitement we were off, heading out of Huaraz and up to the highest point of our trip so far before descending back down to the coast. 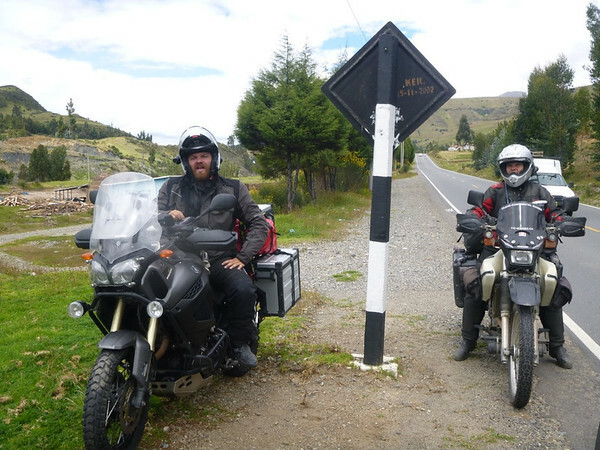 About twenty minutes outside of Huaraz, we spotted an adventure bike pulled over on the side of the road and the rider lying on the grass. It turned out that the chap was taking a quick nap and not hurt (phew! ), and that he was travelling north from his native Chile. After a quick meet and greet and a few photos we were back on our respective ways. 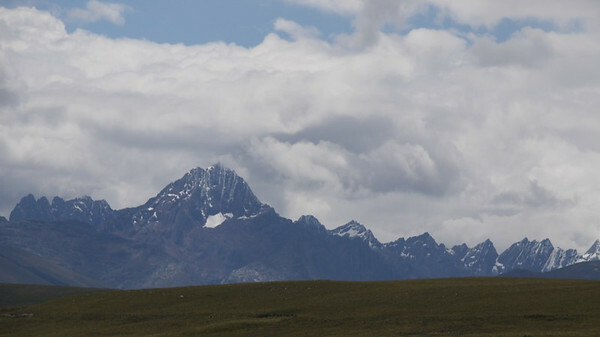 A view from the road leaving Huaraz. The road continued its gentle climb upwards, at first passing through small towns, then rolling countryside, up past the tree line and into high Andean plains. The riding was magnificent with very little traffic and beautiful scenery around every curve. Magnificent rock formations, snow-capped mountains, and rolling grasslands surrounded us as we traversed a land that seemed forgotten by most. As we rode on, dark clouds started to roll in and we could hear thunder in the distance. Pretty soon we were donning our rain gear as the rain came down and the temperature started to drop. At 4000 meters, it became quite chilly (the temperature gauge on my bike read 12 degrees Celsius (including ambient engine heat), something we hadn’t seen since Baja Mexico many months ago). Passing through Conococha (a mining town also known for its local cheese) we reached our top altitude of 4085 meters before starting our descent through the clouds and down one of the most amazing roads that I have ever ridden. Switchback after switchback lead us down past sheer rock faces, purple flower covered mountainsides and down, down, down between dry desert mountains dotted with cactus, and reminiscent of scenery in Utah or Colorado, USA. Great curves, smooth roads, and landscape that never failed to impress. If you happen to be in this area, it is not to be missed (just don’t take a bus since they all travel at night and you won’t be able to see a thing). 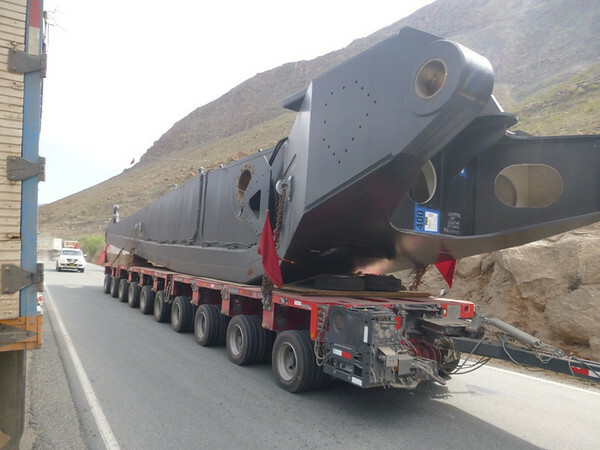 Mining equipment being dragged up the Andes piece by piece. Our destination was Barranca since we didn’t know how long it would take to ride the road, and we wanted to check out the ruins at Caral, the Sacred City, but didn’t know how long it would take to visit. 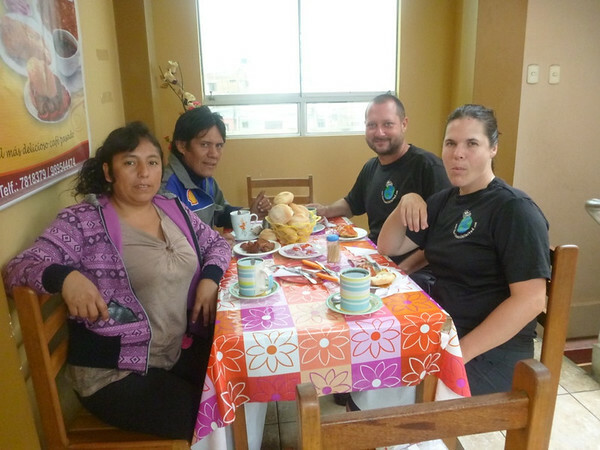 We were previously contacted by Cesar who was friends with Jorge in Chimbote, who also ran a moto-posada in Barranca and who invited us to stay with him while we were in town. We were undecided and decided that a hotel might be more simple and allow us an early morning departure time as opposed to staying with someone. As fate would have it, as we pulled away from Hotel Chavin, due to laughable rates (85 soles per person, about USD$60 ), we were suddenly surrounded by a group of bikes, with some familiar faces. 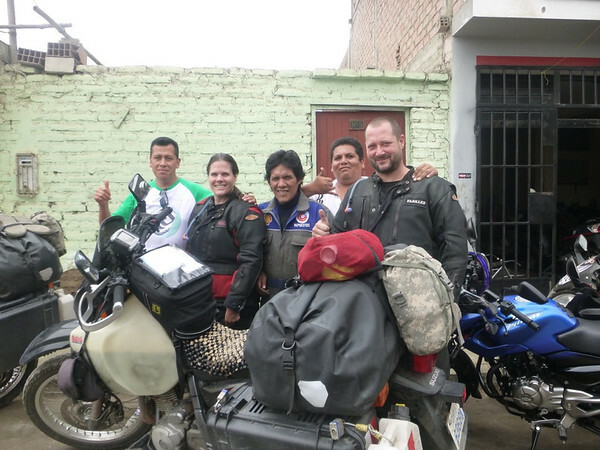 Our Colombian friends from Chimbote were amongst the riders and were heading out of town to Lima accompanied by Cesar and a group of riders from his club. Never ones to turn away happenstance, we followed Cesar to his shop (he’s a mechanic) where he explained that the bikes would be parked, a few blocks away from his house. Anyone who has seen our bike set up and packing scheme knows that it’s not ideal for us to be too far from our bikes as packing and re-packing is somewhat of a production and we explained that we would prefer to be close to the bikes. Cesar, who was happy to accommodate, lead us to his house where we measured the doorway to see if they would fit through into the courtyard. The bikes were just too wide. Without taking the panniers off, it wasn’t meant to be. Fortunately, Cesar knew of a hotel close by, so it was off to check it out. When we pulled up in front, Adam stated that his bike felt a bit squirly like he had a flat, and indeed he had. The owner of the hotel showed us into the parking space where we started a tear down of the luggage and removal of Adam’s rear tire. This would mark our sixth flat of the trip; six flats in six months. The flat was actually caused by a hole in the patch that was put on in Huanchaco. Adam can only imagine that having removed a small piece of wire repairing the previous flat, he must have missed a small piece. A funny thing about the hotels in smaller cities in Peru is that many of them tend to double as love motels, and this one was no exception. Piel de Angel offered complete discretion with private parking and 21 adult channels on the TV, or so says its sign. It was a bit like the love motel that we stayed in near Salina Cruz in Mexico. I wasn’t quite sure if it was one or not (I hadn’t noticed the 21 channels thing yet). The rooms were decorated with a homey flair yet signs on the wall asked patrons to keep control of their body fluids (or see we believe), in not such a direct way, as well as a menu on the wall featuring food, alcohol, toiletries, and prophylactics. I suppose in small towns without much in the way to attract tourists, hotels need to offer other services such as hourly rates in order to survive. No matter. We were given a good rate (40 Soles, or about US$15 for a triple), the owner was friendly and helpful, the room was clean, and there was secure parking. And Cesar didn’t even bat an eyelid, leading us to come to the conclusion that love motel, or at least those that double as a love motel but probably accept families as well, are just a part of the culture and completely acceptable. 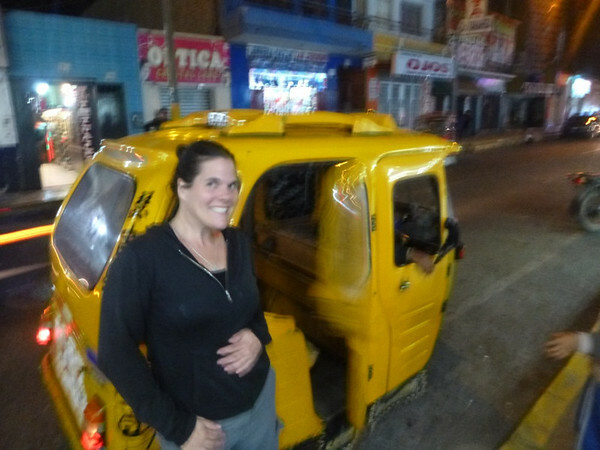 Our first moto-taxi ride. Lots of fun being in one, rather than nearly splattered by one. 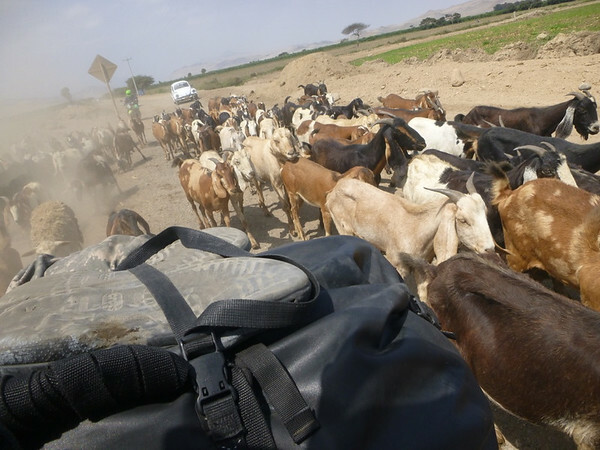 We had heard that Barranca was not a safe place at night, but we had spent more time than expected repairing the tire, and so venturing out for food would now be done in the dark. The owner of the hotel, Juan, assured us that it was completely safe to wander around at night and we set off for the main square to find some sustenance. Admittedly it was a dark walk and we passed through an area of warehouse fronts that seemed less inviting, but we never felt threatened or afraid. Barranca is just a regular town with regular people going about their business and nothing to be afraid of, in my personal opinion. Stupid big chicken dinner for S/10 (USD$4). Actually, it was probably rooster. We eventually seated ourselves down in a restaurant serving roast chicken. 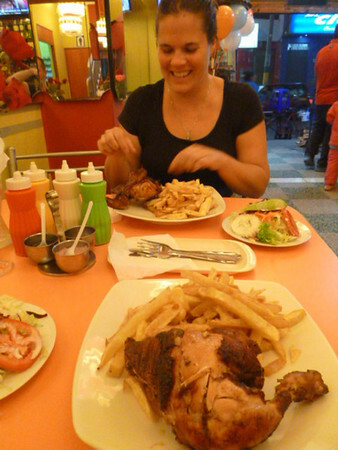 We ordered a quarter chicken with fries and salad for 10 Soles each (under USD$4). When the food arrived it was enough to feed a family of four. The chicken was most likely a rooster, and the pile of french fries was embarrassing. The salad was more of a salad than we had seen in ages with avocado, beets, and carrots. It was way too much food, and we stuffed our empty bellies until full, still leaving about half the fries on the plate. We weren’t hungry but it was dinner time (9pm or so) again. It wasn’t long before we were back at the hotel when Cesar showed up for our coffee date. He brought along his wife, son, and daughter, and we all hopped in a couple of moto-taxis (our first) in the direction of a cafe. Even though we were stuffed we couldn’t turn down and offer for a sampling of papa rellena (a ball of mashed potato filled with beef and vegetables and deep fried). The conversation was somewhat pained due to the language barrier – they spoke absolutely no English – but we managed to get a bit of verbal exchange in. We agreed to meet for breakfast the next morning before we headed off, and said our ‘good nights’. A market which we had breakfast in. For breakfast the next morning (which we were hoping to spend an hour at, at most, for a 10 a.m. departure time), Cesar and his wife whisked us away to a market for chicharron and tamales. Service was slow, and our tamales were mediocre at best (we really missed out by not ordering the chicharron), and our early departure time slipped away. But it was nice to be hosted in a city that was supposedly very dangerous, and to be made to feel welcome. 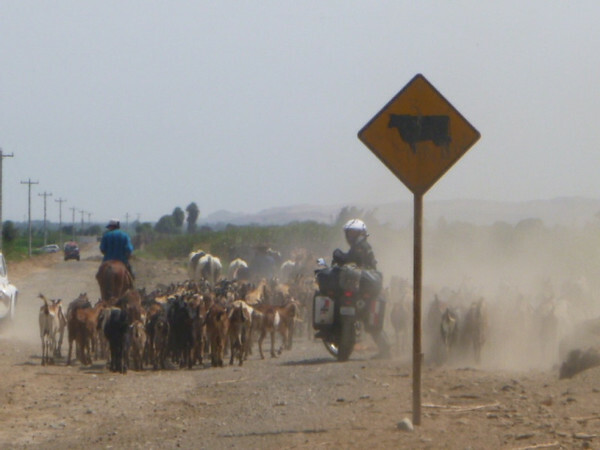 Once we left we headed out along the Pan-American Highway to where the dirt road started in the direction of the Caral ruins. Caral is the most ancient city of the Americas, equally as old as the pyramids at Giza, and was inhabited between 2600 BC and 2000 BC. The ruins are scattered across 35 square kilometers throughout the Supe Valley. We were keen to see them and hoped that we had left enough time before heading into Lima. The first few kilometers of road were typical hard-packed dusty dirt shooting straight off through farmland. No problem. About 5KM down the road, however, we started to hit a bit of mud. It also appeared that they were either getting ready to pave it or lay new gravel as one side of the road was blocked with mounds of deep dirt and gravel. Down to one lane, this side of the road was being passed over regularly by a watering truck making the road a slick mess. Unfortunately, our tires were not suited for this kind of riding and Adam’s front kept slipping out from underneath him. We decided to turn back with the knowledge that there were three other roads that lead to Caral from the highway, south of our first attempt. According to the sign, I am riding through a herd of cows. Still not convinced that these are cows. At Huacho, the road most travelled by buses taking tourists to Caral from Lima, we headed off to Caral on our second (and last) attempt. This road was similar to the first one, only with much more ‘washboard’ surface. 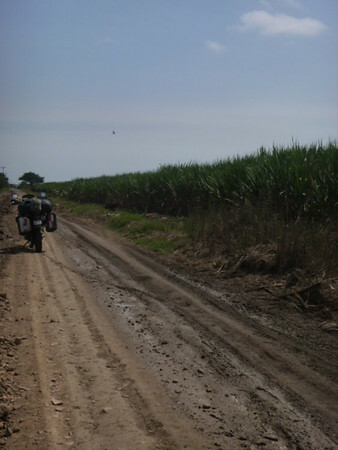 We passed through a few small towns, cane fields, and came to a river where we hung a left and started to follow alongside. Soon the gravel grew deeper and sand started to become a bit of an issue. 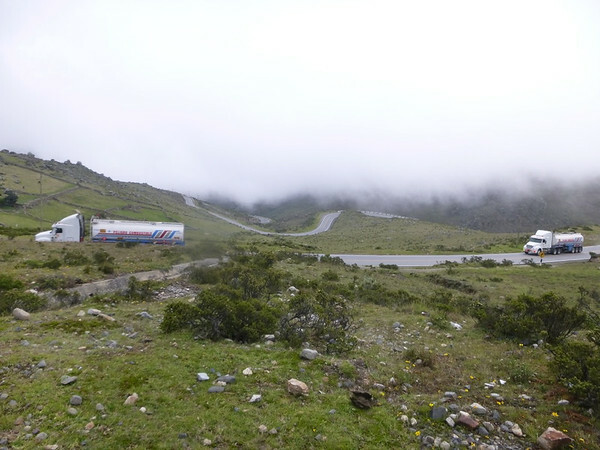 Twenty five kilometers of struggling through loose road surface on poor tires, wasn’t appealing and we gave up on our Caral dreams and turned back to the highway. Slippery mud no match for our worn Avon Gripsters. 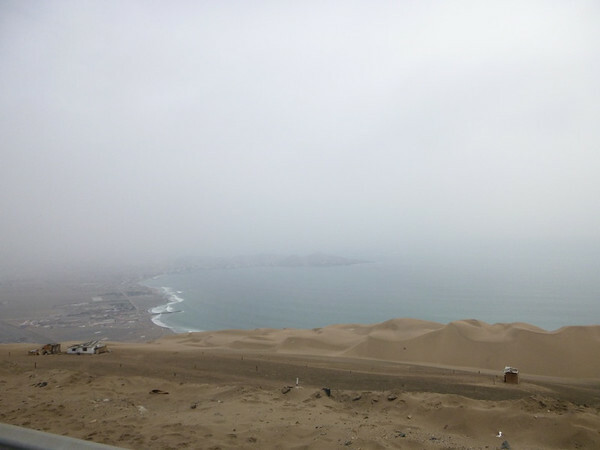 Lima was only a few hours down the coastal road (the windy, desert, blowing, overcast coastal road), and we made our way past sprawling open spaces to the busy city. If you listen to the hype, you do not want to drive in Lima. It is very dangerous and you will most certainly get into an accident. This had me worried. Soon, however, we discovered that while Lima has its own special kind of crazy drivers, they really didn’t seem to be any worse than any other drivers we have encountered in Latin American cities. There are certainly a lot of cars, and a lot of drivers doing bonehead maneuvers, but on the whole I found Lima drivers to actually be a little bit polite. They at least check their blind spots before making a lane change whether there is someone there or not. And they will kindly honk their horn to alert you to their presence before they run you over. A bit of an improvement, if you ask me. 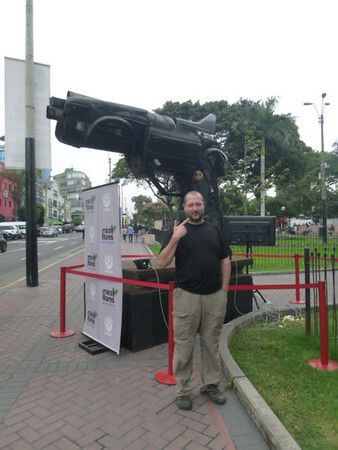 A very interesting “piece”…and anti-drunk driving monument made out of pieces of automobiles. 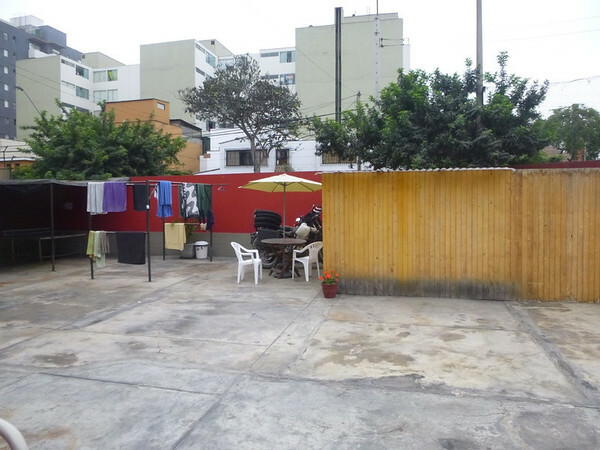 We stayed at the Hitchhikers Backpackers Inn/Hostal that had ample parking and supposedly camping, in the Miraflores area. The receptionist at the desk, however, clearly stated that there was no camping unless you were sleeping in your vehicle, despite there being a photograph on their website showing tents pitched in their parking lot. We opted for the room with private bath, and at $34 per night, isn’t terribly expensive for a city, but quite pricey for our Peruvian experience, so far. Ample parking but no tenting (despite their website portraying tents next to overlanding trucks). Adam was quite keen to show me around Miraflores and some of the places that he had visited when here previously. 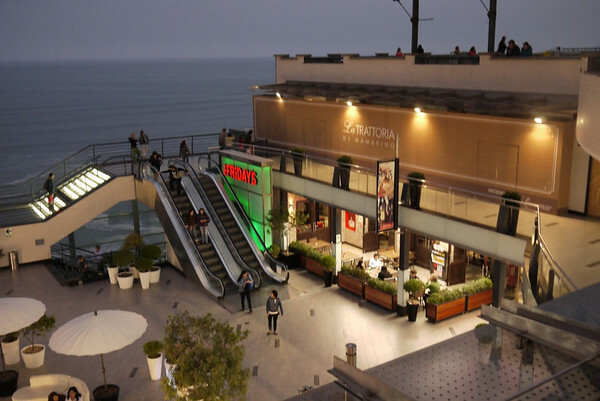 For our Toronto friends, Miraflores is much like a grandiose Yorkville, complete with swanky restaurants and cafes, nightclubs, high-end shopping, and luxury hotels. There is even a Starbucks here! It didn’t disappoint and I could even picture myself renting out an apartment here for an extended stay. Guayaquil, Ecuador has their “Iguana park”. 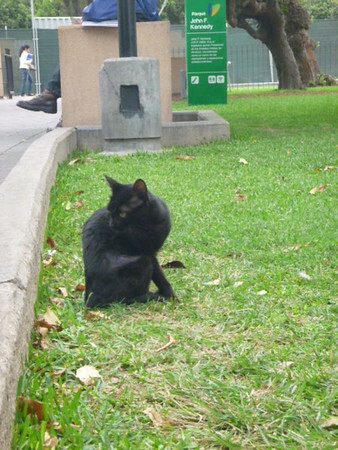 Lima’s version includes many gatos. We also learned that our friends Sheldon and Ewa were still in town, and close by, so we dropped them a message and made plans to meet for a walk and some dinner that evening. They showed us around to some areas that we had not been to – the waterfront, Parque de Amor, and a high-end shopping centre along the ocean. 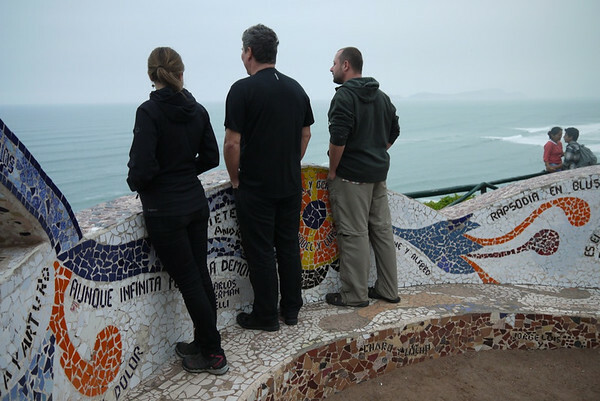 I can’t say that we have been suffering for a lack of anything on this trip, but Lima will be one of the most difficult places to watch grow smaller in my rearview mirror. 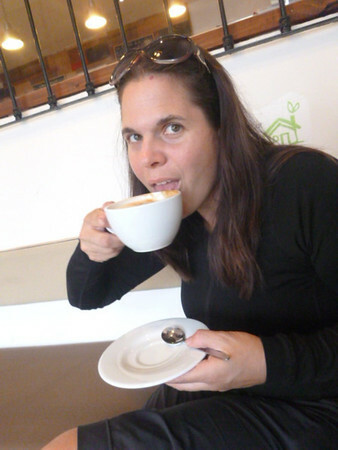 So many places to shop; nowhere to stash it on the bike (*sigh*), what is a girl to do? Ewa, Sheldon and Adam pondering the mysteries of life. A very interest archeological site in the heart of Mira Flores. Our culinary adventure also continued with our first tasting of tacu-tacu: a rice and beans pancake, fried on the grill. Variations include a breaded and pan-fried steak and/or a fried egg, although ours did not. In any case, it was tasty. As a rice lover, my stomach has been more than happy to see so much rice on my plate. 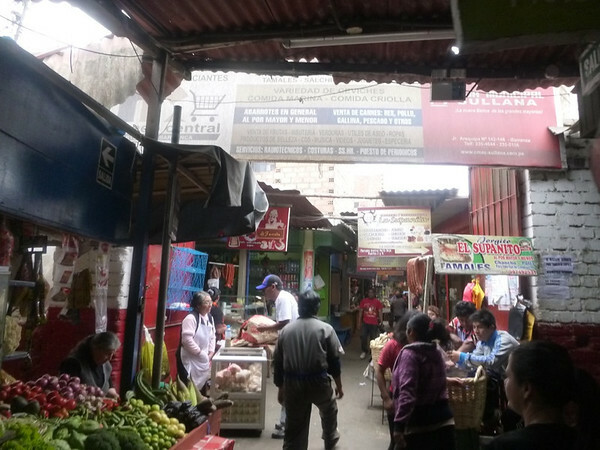 Chifa is super abundant here with a number of restaurants on every block, and if neither that or typical Peruvian foods suits your fancy, you can always hit the McDonald’s, Pizza Hut, KFC, one of the numerous gourmet burger joints or steak houses (Tony Roma’s or T.G.I. Friday’s). 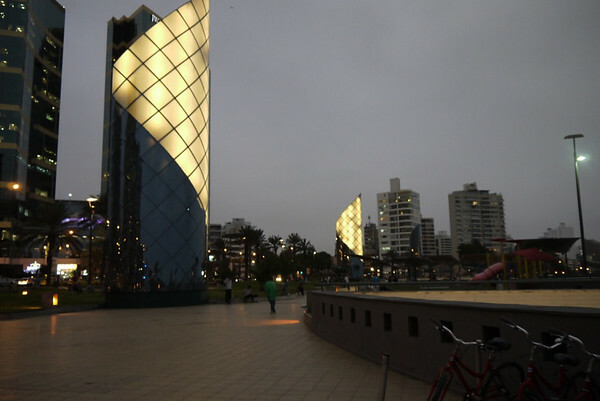 Lima is a world-class city with heavy North American influence. Even Canada Dry is on the grocery store shelves, in the imported foods section. 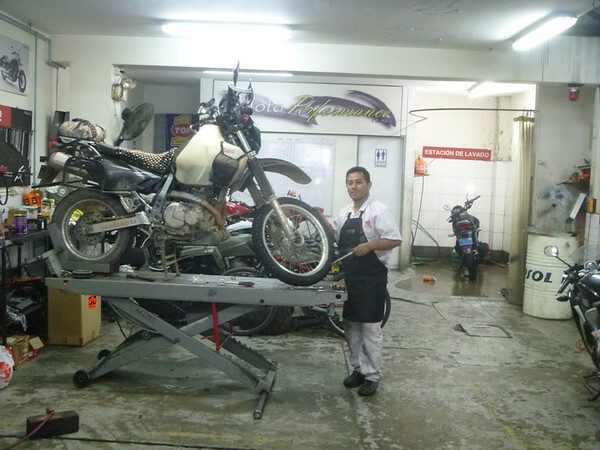 Finally, one of the main reasons we opted to spend some time in Lima, is that it was time to change our tires. 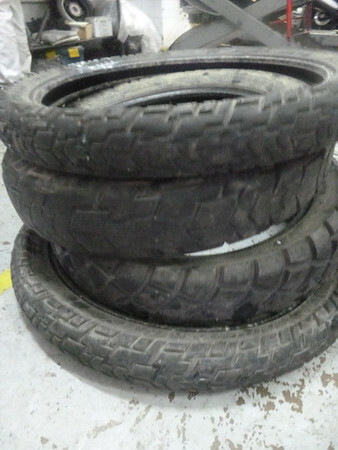 We departed Ontario running Avon Gripster tires, a well know, economical, high mileage “classic tire” – and not really in fashion at the moment. Not having run them before, we expected to run them for as long as necessary as a sort of commuter tire. At first, they were to at least get us out of the US, and then Mexico. We didn’t figure that they would get us through Central America, and then Colombia, and then Ecuador, and definitely didn’t expect Peru. This is not entirely true as I replaced my rear Gripster in Cobán, Guatemala with a Kenda K761. This tire was replaced somewhat prematurely as it probably would have lasted through most of Central America – and by the looks of Jenn’s set, perhaps Colombia, but we didn’t really want to “chance it”. Traveling like this, is a good plan to buy something when you see it, rather than delay and hope to find it later. With this said, we had always planned on replacing tires before reaching Bolivia to something more aggressive, and probably in Lima. Their tire mounting machines make easy work of what would have taken me a good few hours. It seems that my rear tire Avon Gripster did quite well once outside of the USA, but it seems that my heavier body weight, extra gear (before we got rid of some stuff – sending it home), and just hard riding with relatively fast speeds on course highways did a number on my rear tire before we even reached Texas. 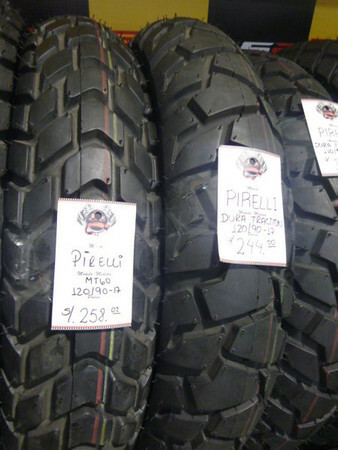 We recall several stops where we could smell the rubber of the tires due to heat build up. We haven’t seen this situation having left the USA and suspect that my rear Avon Gripster took some abuse (perhaps 1/5 done) within the first week of our departure. In the end, Jenn got over 22,000km on her set as I did on my front tire. We changed my rear Gripster at 13,000km and the Kenda at about 10,000km. The Kenda had quite a bit of tread life left but was starting to get an annoying wear pattern. 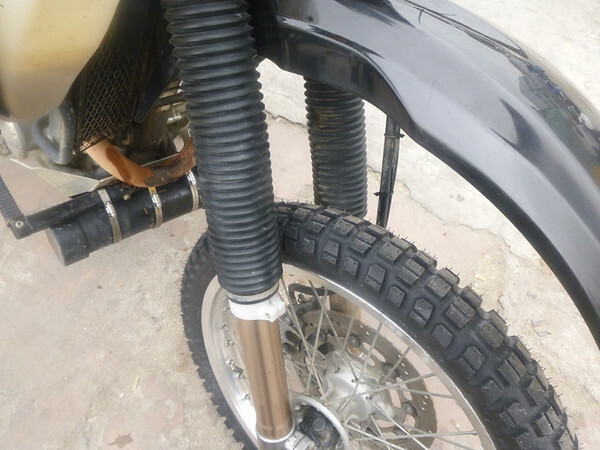 After much fussing and visiting the best places to by tires in Mira Flores, we settled for Brazilian made Metzelers – Enduro 3 Sahara on the rear and Karoo 2 (T) on the front. 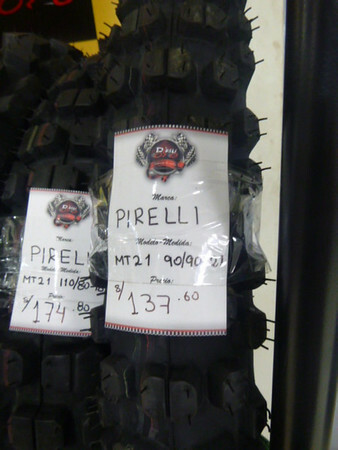 We decided not to go with a much more aggressive tire like the Pirelli MT-21, or actually this was partially decided for us due to lack of availability. They would have been excellent of road, for example, in certain parts of Bolivia, but their wear life is not great. Party out back (-lo). Actually, this Enduro 3 is a little grippy to be considered a full mullet configuration. In the end, we have decided to put together a sort of “mullet” configuration. Shorter life tire on the front, longer life tire on the rear (sho-lo), which also happens to be a more aggressive tire on the front for more tracking (business up front), and let the more road oriented tire on the rear tags along, perhaps even getting a bit squirmy at times (party out back) – hence the use of the term “mullet”. 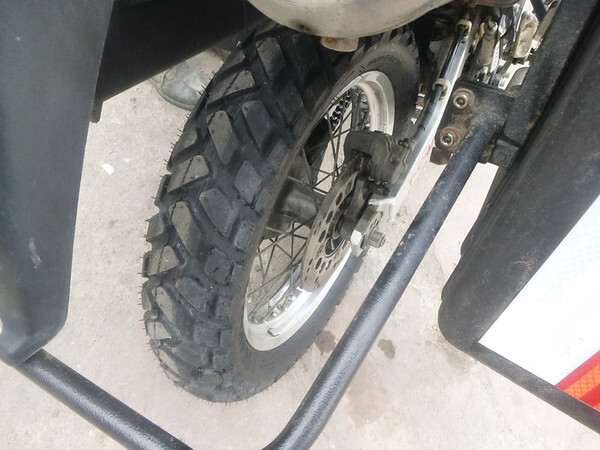 If we need to get precise about our terminology, I don’t think we are using a true mullet configuration since the rear Enduro 3 Sahara is a bit more off-road oriented and not strictly a long-life road tire – I guess you could say that we have gone with a partial mullet. Our new set of tires have been a joy on the highway so far as our previous tires were starting to feel “sluggish” as they were starting to flatten out and become less responsive feeling. I suspect that we have chosen a pretty good combination for Bolivia and the journey ahead of us. Desert and beaches and mountains, oh my!